Given the provenance of this property, it’s understandable why the Ramada Plaza West Hollywood Hotel and Suites has become the de facto hotel for both the music and entertainment business in West Hollywood. This is where the Tropicana Motel once stood, the famed rock-and-roll refuge with the black-tiled swimming pool. 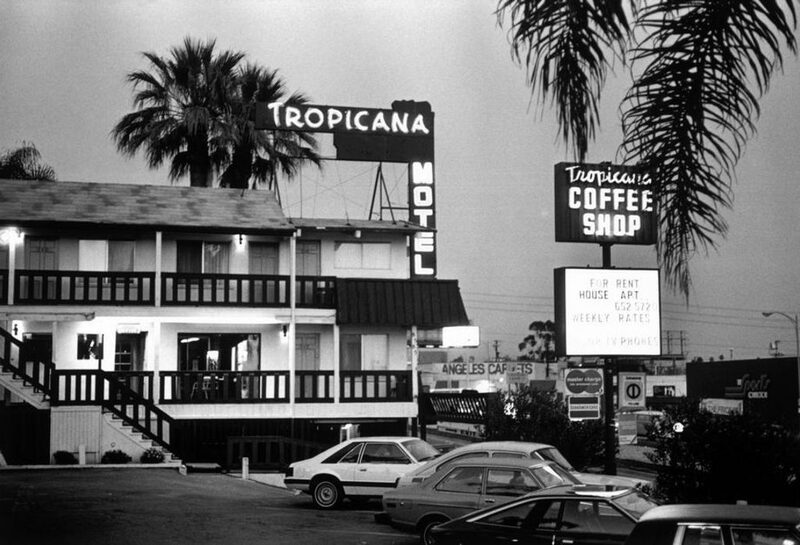 “TheTrop” was where Jim Morrison lived, as well as Tom Waits, and where Andy Warhol filmed “Heat” and where Janis Joplin partied, and where other residents included Blondie, Led Zeppelin, Springsteen, Sam Shepard, the Clash, the Beach Boys, Elvis Costello, and Guns and Roses. In other words, this is hallowed ground for those who like to burn the midnight oil. The Tropicana Motor Lodge was inexpensive, easily accessible and located on U.S. Route 66 – a.k.a. the Mother Road – the major path for migrants going west from Chicago to L.A. The Ramada Plaza West Hollywood Hotel and Suites sits on the site of the former Tropicana Hotel and Motor Lodge on Santa Monica Boulevard — near the end of the famous Route 66. The Tropicana was basic and affordable, the swimming pool was tiled in black, and there are many stories of long, late-night parties. The motel was patronized by the rock and roll industry in the sixties and seventies. Jim Morrison of the Doors lived there, and would often spend days sleeping off his Southern Comfort binges. Chuck E. Weiss, Tom Waits were residents too. Frequent guests included Janis Joplin, Van Morrison, Bruce Springstein, Eddie Cochran, the Beach Boys, Jim McGuinn of the Byrds, Led Zeppelin, Guns and Roses, Martha and the Vandellas, and Frank Zappa, whose “freak-outs” were legendary. It was a first stop on the way up the rock and roll ladder, as well as a place to stay once you’d made it. The big record companies grew on Santa Monica Blvd and the Sunset Strip during this era and made LA the rock and roll recording center of America. Today, LA is still the recording capital of the world. Rock stars live and record here. Award ceremonies happen here, and there is still a bustling club scene; Musicians walk the streets with guitars, gigs are advertised with the daily specials on restaurant boards, telephone poles are covered with tacked-up concert news. 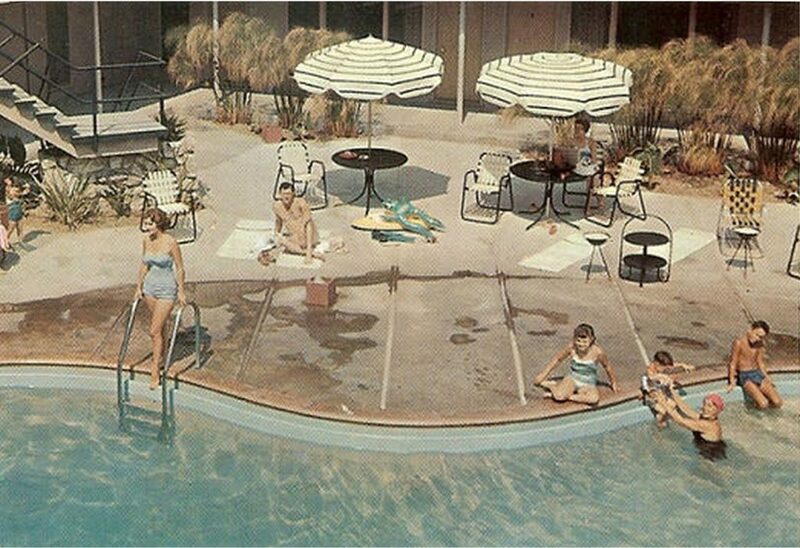 Tropicana pool before the black tiles. The Ramada built on this site in the 1980s is still a stopover for the entertainment industry, as well as international leisure travelers. Bands and music buffs reserve your rooms now!